Cook the bacon until crisp, and drain. Reserve the grease, and crumble the bacon. In a large skillet or wok, heat 3 tablespoons of the bacon grease and sauté the onion and carrot for a few minutes until softened. Add 2 to 3 more tablespoons of grease, and add the shredded cabbage along with half of the cooked bacon, and stir fry until the cabbage starts to brighten in color, turn glossy, and soften. This will only take a few minutes, but you can customize your slaw by cooking it a little less or more than this. Season to taste with salt and pepper. 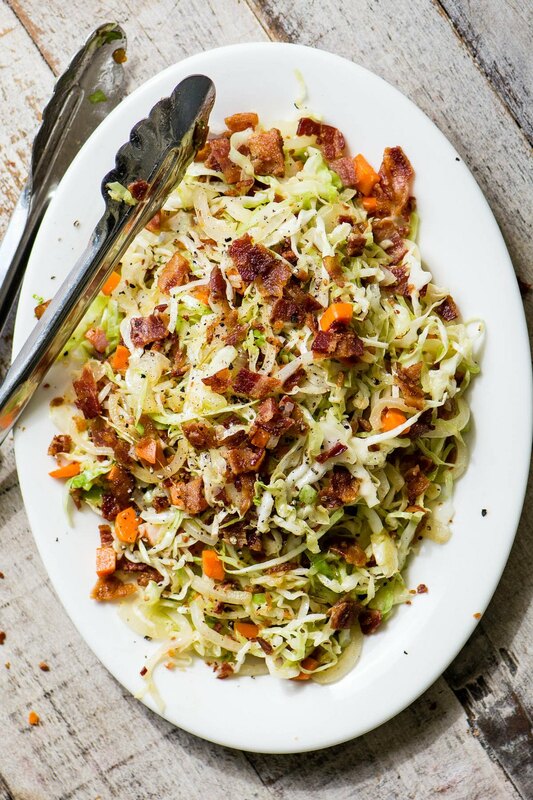 Serve the slaw hot or warm, topped with the rest of the crumbled bacon. Leftover slaw stored in the refrigerator will stiffen due to the bacon grease. Bring the slaw to room temperature or heat it briefly in the microwave before serving.